HomeTabloidRelationshipsAre Babies Afraid of Plants? We all know this thing that by nature, all babies pick up things and put in their mouth but have you ever seen that your baby is eating plants? The first simple thought which came in my mind was; may be due to movement of leaves and grass due to wind, make babies think that they can hit them or harm them like other moving or living creatures, might be babies gets irritated with dirt attach with plants and leaves, might be due to ants or other small insects crawling on them etc. But that was my thinking being common woman as I am not a typical researcher. Then I started searching and found that a new research shows that babies have inborn reluctance to touch plants, a hatred that may guard them from dangerous toxins or thorns. That’s why they are not so careless whenever go near to plants rather than us, we adults who are having habit to reach out and touch plants and beautiful fragrant flowers. That discovery would not be the first time that babies were found to be born with an intrinsic fear, but most of the time such fears are directed toward dangerous animals like spiders, lizards and snakes. May be it seems odd that babies should be scared of plants, since they are not that kind of living things who attack on us, but we should know that animals are not the only thing in our natural surroundings that could do us harm, plants can be silent harm full thing as poisonous plants are actually much more powerfully widespread than poisonous creatures, so it’s possibly not shocking that such an aversion has evolved. Another point that could be involved that an inborn fear of plants also helps protect against toxins, thorns, fine hairs or oils of plants that can injure tissues, can make babies ill or allergic. Yup truly! 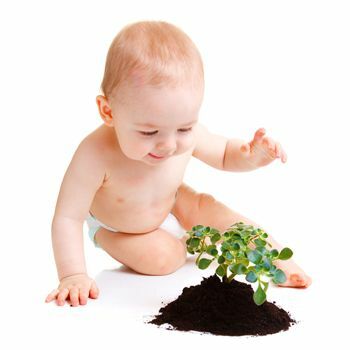 Many infants are found to be allergic of plants. My own brother, when he was a baby till the age of six, he was allergic of flowers, especially rose flower. His eyes got red and swollen whenever he go near to them and touch them. Don’t know the actual reason, might be due to their pollen. Moreover, like animals, plants have a number of chemical and physical defenses to protect them from getting eaten or damaged. If we ingest them than certain plant’s toxins can be deadly harmful. So many animal groups developed physiological opposite actions to get around plant defenses, such as queasiness or the capability to break down plant toxins. Some animals even have behavioral strategies to defend themselves from plants. Same as humans may also have developed ways to deal with plant defenses. For example young kids are naturally reluctant to the bitterness of some vegetables and do not like to eat vegetables perhaps because toxins of plants are commonly bitter. The study which I read to determine, if infants are more hesitant to touch plants than other objects or not? It was based on a simple experiment between 8 to 18 months babies that involved placing a plant including basil or parsley, an imitation plant and a fabricated object in front of babies while the child sat on his / her mother’s lap. No other things were presented in the room to distract the baby’s concentration. Researchers found that it took approximate five seconds longer on average for the babies to attain out and touch the plants or artificial plants than it took them to grasp any other entity. With all the above I came to conclusion that there were several reason of scaring of babies from plants, some are natural and inborn due to nature’s defense philosophy and some may be due to us, we parents, who always warn our kids to not to touch leaves or flowers because infant may pluck leaves or may make their hands dirty.